January 26, 1975, was established as the World Day of Environmental Education. This initiative was proposed by the United Nations after the “International Seminar on Environmental Education” (Unesco-UNEP) held in Belgrade, in the then Yugoslavia, from October 13 to 22 of that year. As a result of this seminar “The Belgrade Charter” was published, a document that set forth the goals, objectives, target groups and basic guidelines of the Environmental Education programs at a global level. Since that year, the care of the environment and its conservation is the biggest challenge for people and organizations committed to the environment. That is why, day by day the population concerned, in their need to be informed, aware and educated on the issue, carries out actions which contribute to the proper use of natural resources, implementing different strategies for the reduction of pollution. The aim of commemorating this date is to identify environmental problems at all levels and to raise awareness among the population and governments of the need to preserve and protect the environment. The concept of “Environmental Education” was defined in 1969 by William Stapp, PhD from the University of Michigan, who shared the idea that environmental education promotes knowledge, values, attitudes and skills in each individual, conductive to respect the environment through cooperation at local, national and international levels in the resolution of environmental problems. Delphinus has a very important commitment to Environmental Education, understanding that the interactive experience with dolphins creates important emotions in the persons who do this work; this emotional state is conveyed to raise awareness among people on specific problems that humanity is causing in marine environments. 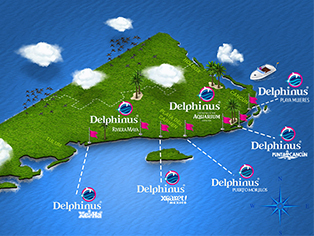 The instrument developed by Delphinus is the Environmental Education Plan consisting of three programs. The first one is the Environmental Leadership Program, which promotes environmental training addressed to the organization’s staff. As part of the specific actions carried out in 2016, 14 sessions were organized to strengthen basic training for 250 staff members in the 6 habitats. The “Blue Team” was implemented with the participation of 11 managers, supervisors and environmental educators; the outcome was the presentation of water, energy, gas and diesel-saving projects, documenting the actions to be implemented by each habitat. To turn these resource-saving plans into formal projects, Delphinus participated as a “Leading Company” in the “Environmental Leadership Program for Competitiveness” conducted by PROFEPA (Mexico’s Environmental Protection Agency) which involved 7 companies of the Group; strategies were implemented to save 974,193 kWh/year of energy, to prevent the emission of 442 tons of CO2/year and the reduction of 10.8 tons/year of solid waste, with estimated savings of 1 million 548 thousand 583 pesos per year. The second one, is the School Educational Visits Program, which is an environmental training system aimed at basic level groups from public and private schools in the State of Quintana Roo; it encourages reflection by presenting the environmental problems that marine ecosystems face, their importance to human activities as well as the environmental services they provide by promoting knowledge, reflection and commitment through thematic content focused on the four axes that follow an experiential learning sequence, namely: “I Belong”, “ I Learn”, “ I Reflect”, “I Commit”. By the end of the 2015-2016 school cycle we received a total of 19,160 participants, of which 17,423 were students and 1,737 were teachers. The Environmental Communication Program is the third part of Delphinus’ Environmental Education Plan and is aimed at visitors, the community in which we operate and surfers. One of the main actions of this program is the design of the assembly of new modules of interpretation of the different habitats with environmental content, in addition to imparting messages with the support of visual material at the end of each interaction, on the four main problems affecting marine ecosystems (climate change, overfishing, alien species and solid waste pollution), as well as practical and achievable personal actions to influence the resolution of these issues. In community outreach activities “The Festival of the Oceans” is organized annually through which the community is invited to learn more about the ocean and its contributions to the life of the planet through art, dissemination of science, gastronomy and ecological actions. In 2016, the results obtained were: the collection of 506 Kg. of waste in three beach clean-ups with the collaboration of 280 volunteers, encouragement of consumption of lionfish, promotion of art through fence-painting in Cancun, children drawing and photography competitions. Other important actions to involve the community in specific problems caused by man to the oceans are beach clean-ups, with the participation of staff members, local associations dedicated to environmental care and volunteers in general. In 2016, 2,503 volunteers collected 3,051.4 Kg of waste organized in 7 beach clean-ups in the National Park of Isla Contoy, National Park Arrecifes in Puerto Morelos, Isla Blanca, Playa Tortugas and Playa Langosta. This is why in Delphinus we celebrate all year long, commemorating environmental education by restructuring our behavior and promoting collective organization to protect the environment!